Keep your Bitcoins secure... in your head! One wonderful thing about Bitcoin is the ability to have complete and utter control over your money. It is a double-edged sword, however, since one can easily lose their wallet file or throw away a hard drive containing $6.5 million in Bitcoin. 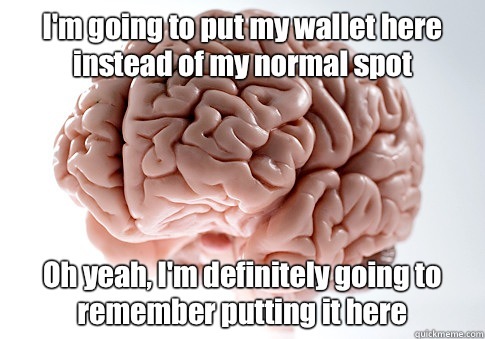 That is where the magic of a brain wallet comes in. A brain wallet, or paper wallet, or ring wallet, or whatever else you want to call it, is simply a string of random (or not so random) words that you can use to recreate your Bitcoin wallet, should it become lost or deleted. You can create a brain wallet using a Bitcoin client, such as Electrum, or online at a site like brainwallet.org. 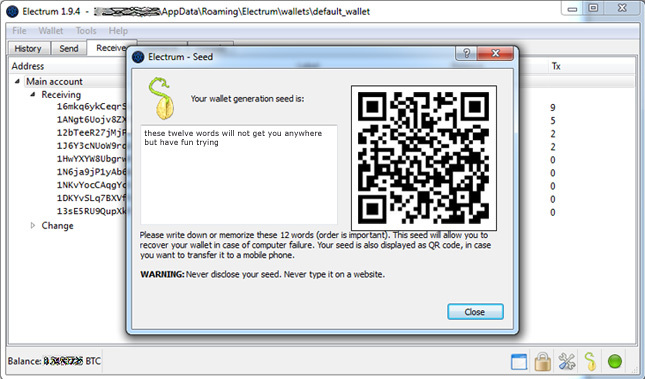 When you first run Electrum, it will generate a seed for your wallet. NEVER save the seed's words or QR code anywhere on your computer or online. Write the words down in the same order you see them, or print out the info and keep it well-hidden, or memorize them. I would recommend keeping a written copy of the words somewhere because you don't want to have to rely on your memory if it means possibly losing 10 BTC, for example. If you want to keep your brain wallet complete, do not add any new addresses to your wallet. Once you add an address, you will not be able to recover that address, and any Bitcoin connected to it, from your seed. The nine addresses Electrum generates should be enough for most purposes. What I personally do is use blockchain.info for my hot wallet, sending and receiving smaller amounts for day-to-day use, and send larger amounts to my Electrum wallet in cold storage. My hot wallet has a bunch of addresses I created for the various sources sending me Bitcoin. It might be easier to go to a website and generate your brain wallet in seconds, rather than installing a client like Electrum, but then you have to worry about importing the private key to a wallet anyway, so it depends on your preferences.